Allerta! :Conducting Macbeth at the Arts Centre this month is a debut for you – did you enjoy learning the score? 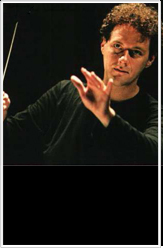 Simon Hewett:I first learnt the opera in Hamburg but never conducted it myself. Initially I was guilty of thinking there was a bit too much of the early Verdi oompah oompah in it, until I saw a performance in Paris last year, which bowled me over and made me hear the music as absolutely spine-chilling. I hope I can pull off something similar. A:How does this early piece reveal the building blocks of Verdi’s mature style? SH:As a huge admirer of Shakespeare, Verdi’s first 'Shakespearean' opera meant a great deal to him, and he really took himself out of his comfort zone by experimenting with vocal writing and orchestral colour. When you compare Macbeth (1847)to the bel canto operas of the 1830s, it is strikingly 'un-bel canto-like'. It provides a great example of the energy with which Verdi pursued his ambition to weld vocal expression to drama (sometimes at the expense of singability!) – something with which he continued to experiment right through to the masterpieces that crowned his career in the 1870s and 1880s. In the lead-up to the première of Macbeth, he continually corresponded with the singers, asking them to study the text and the dramatic situations, advising them that the most effective musical delivery would then come of itself. One of his main goals in Macbeth was to shape the vocal line with a view to its dramatic effect. Vocal beauty was therefore not a goal in and of itself – he demanded instead of his singers that they use all the resources of vocal colour at their disposal, and he used adjectives like “hollow”, “veiled”, “rough” and “stifled”. A:There’s more than one version of Macbeth – could you tell us more about that? SH:The version that is nowadays performed is an amalgamation of the original 1847 version and the 1865 revised version. Two styles co-habitate within the one opera – the first possessed of great instincts, but with a still quite unsophisticated harmonic language and instrumentation, the second far more subtle and refined in its deft welding of vocal line to dramatic situations, greater originality in the orchestral writing, and a greater sense of dramatic momentum with less reliance on formulaic operatic forms. A:The roles of Macbeth and Lady Macbeth are notoriously difficult to sing. What makes them so? SH:Possibly the fact that Verdi was not interested in whether they were singable! That said, today we are sometimes guilty of expecting everything on stage to be sung with effortless tonal beauty. If you read Verdi's letters, you get the impression that he was sometimes actively seeking the opposite. Certainly with respect to the role of Lady Macbeth, some of his comments are extraordinary – he argues against casting a singer with a “clear, limpid, strong voice”, writing that “....I would rather that Lady Macbeth didn't sing at all, I would rather her voice were rough, hollow, stifled...”. It makes you think that he was sometimes composing against, rather than for singers, in order to make them sound on the edge of their possibilities. A:What are the challenges of conducting this opera? SH:Persuading the singers to take risks, and to not always sing beautifully! SH:Succeeding! It is also a gift of an opera for the chorus – especially a chorus like Opera Australia’s, that never just bellows, but loves to find weird and unusual colour combinations. A:Since going freelance, what have been some of the highlights of your career? SH:Harry Kupfer's Otello in Sydney in 2008 was a wonderful experience – a great cast (Dennis O'Neill, Cheryl Barker and Jonathan Summers) and it was the first time I had conducted the piece, despite having worked on it many times as an assistant. It is in my opinion one of the greatest of all works for the operatic stage, and I will never forget doing it for the first time. The Opera Australia Chorus were also fabulous - you really do not find a chorus anywhere else as musically ambitious, dramatically committed and as good fun to work with. A:Do you miss having a full-time position? SH:Not at the moment. Although I still conduct quite a bit in Hamburg, I no longer have the administrative responsibilities that I had when I was Kapellmeister and Assistant Music Director. When you have a full-time position, there is so much organization and planning to take care of that the orchestra pit begins to feel like a place where you go to escape! A:Are you and your family enjoying living in Berlin? SH:We LOVE Berlin. It has all the advantages and attractions of a major European capital without the disadvantages. It is much less crowded and busy than Paris or London, but within easy reach of all the European centres. I work regularly with the Komische Oper and the Brandenburg Symphony Orchestra, so for at least a couple of months each year I don't need to travel away from my family for work. Berlin has a vast cultural life, and we live in Tiergarten, very close to the big park in the middle of the city, and the river, which is great for our kids. A:What do the next few years have in store for you? SH:More opera for OPERA AUSTRALIA , which I am thrilled about. I will also go back to the Komische Oper in Berlin regularly, and I will go back to the Paris Opera in 2012 and 2013. And there are a few other things on the horizon. At the moment my career consists of building solid relationships with a small number of companies. I like working with people I know and love because making music requires trust.